Metal detectors has been installed by Israeli police after an attack last Friday by three Israeli Arab gunmen at an entrance to the Temple Mount left two policemen dead. The head of the he head of the Wakf Muslim religious trust in Jerusalem, Abdul Azim Salhab, saying he was speaking in the name of all Muslims worldwide, on Friday rejected the security cabinet's decision not to remove metal detectors at the entrance to the Temple Mount (al-Aksa mosque) compound. Speaking at a press conference in East Jerusalem, Salhab said: "We are one. We all reject the measures to put in metal detectors. We reject the entrance of settlers to the mosque compound. We in Jerusalem represent 1.7 billion Muslims who say in one voice no to the metal detectors. We say no to the arrangements taken by the Israelis against the Wakf." Israeli police installed the metal detectors after an attack last Friday by three Israeli Arab gunmen at an entrance to the Temple Mount left two policemen dead. The assailants were shot dead by police. While Israeli authorities say the detectors are necessary for security, Palestinian leaders say they are a violation of the status quo and are indicative of an Israeli intention to take over the mosque, the third holiest site in Islam. The Palestinians have called for a day of rage Friday to protest the installation and security forces are bracing for a possible eruption of violence. 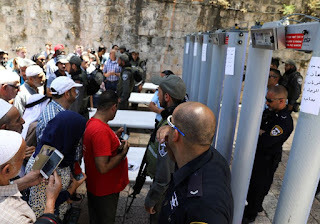 The Israeli security cabinet late Thursday decided to retain the detectors and limit entry to the mosque Friday to those fifty years old and younger. Salhab said: "We are the only authority in charge of taking care of the compound and its renovation. We will pray today behind the metal detectors or in any place where the Israeli police stop us. We ask Jordan to use all its cards to pressure Israel to avoid a catastrophe." Meanwhile, Palestinian president Mahmoud Abbas has called a meeting of PLO executive committee members and other leaders for Friday evening, PLO executive committee member Hanan Ashrawi told The Jerusalem Post. She said the security cabinet's decisions were "generating more provocation of religious sentiments." In Ashrawi's view Israel is doing now at al-Aksa, what it did in the Cave of the Patriarchs (Ibrahimi Mosque) in Hebron over the years. "It is creating facts, encroaching gradually and taking over." "What Israel is doing is telling the whole world that we do what we want with no consequences. It is actually arrogance that no matter what the world says and law says, we will use power, control and coercion." God needs our love! 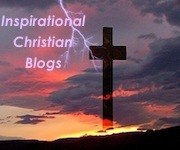 Why does God need our love?